Night diving is a totally different experience than regular scuba diving. 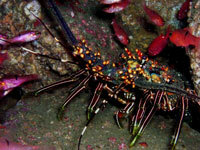 In Cabo San Lucas, most night diving is done in the area of Pelican R ock, where the darkness brings out all kinds of interesting marine life such as Lobsters, Crabs, Sea Worms, and Manta Rays. Your dive light will illuminate the walls, revealing a dazzling display of color that cannot be seen during the day. You may see a moray eel swimming free, which is always a fun sight not often seen by day. Daily between 6:00PM and 8:00PM depending on the season. 1-tank night dive, boat, all taxes, tanks and weights (full gear rental is available at the dive shop for $27.00), and an experienced PADI divemaster. Full Gear Rental is available at the dive shop for $27.00. A night dive is a unique experience. Some people love it, but it's not for everyone. The creatures that come out at night are not always beautiful, and it will be dark. We disagree on these dives - Johann thinks night diving is a wonderful different experience, revealing sea life in a different state of being, while Sandra prefers daytime diving. Think about which camp you're likely to fall in before booking.